Genelec monitors can be found in top professional recording studios around the world. This sonically transparent and balanced 8000 bi-amplified monitor series are trusted by professional engineers everywhere – engineers who were at one time, some of the only people able to justify their heavy price tag. At the smallest end of the 8000 Series are the 8010A, a relatively light unit made of solid die-cast aluminum, faced with with metal driver grilles for protecting the speakers: 3″ driver (80W) – ¾in tweeter (50W.) The back side of the unit holds the base port seated above five dip switches which contour low to high frequency responses to suit your room. The input connector is a balanced XLR input but it can be connected to an unbalanced source using the appropriate adaptor. As many would expect a monitor of this size to produce harsh highs and upper-mids, none are found here at all. The Genelec 8010A possess a smooth and accurate top-end, a deep and well-balanced mid-range (excellent for vocal, reverbs and delays), and a clear low frequency spectrum offering plenty of punch and bass handling. Note: should you need a lower frequency range out of your monitors, the 8010As are compatible with Genelec’s 7050B subwoofer. 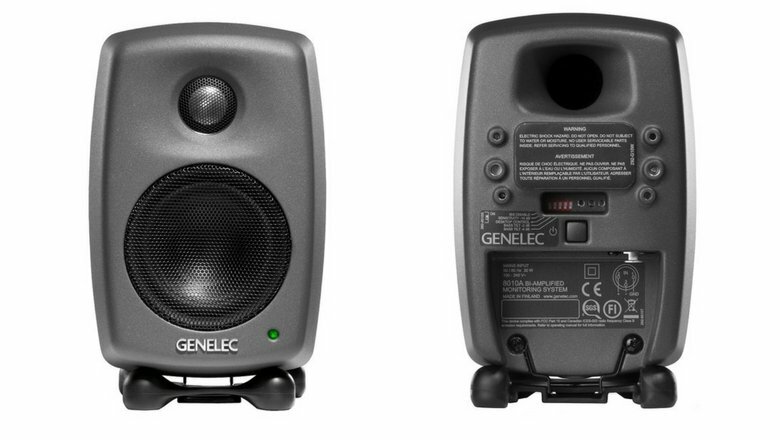 The Genelec 8010A are ideal for small music studios and mobile recording. Genelec monitors aren’t cheap and the reason to that is in the quality of design, sound and components — all of the same qualities found in the 8010As but at a very reasonable price.